PARIS: Much of the world's coastline may be drowned by rising seas sooner than anticipated because scientists now say they cannot rule out a fast-track melting of the Greenland Ice Sheet - a prospect once the preserve of doomsayers. This would spell trouble for Singapore and many countries in the world. The new findings, just published online by Nature Geoscience, warn that the current pace of the melting ice sheet in Greenland may have been seriously underestimated. The researchers drew their conclusions after comparisons with the swifter- than-realised demise of the Laurentide Ice Sheet during the last Ice Age, which took place after a spurt in warming. That event smothered much of North America. 'The word 'glacial' used to imply that something was very slow,' said climate researcher Allegra LeGrande of New York's Columbia University, who was not part of the research team. 'This new evidence from the past, paired with our model for predicting future climate, indicates that 'glacial' is anything but slow. Past ice sheets responded quickly to a changing climate, hinting at the potential for a similar response in the future,' the researcher said. Seeking help from the past, geologist Anders Carlson at the University of Wisconsin led the team that delved into sediment left by the Laurentide Ice Sheet. At its apogee some 20,000 years ago, the Laurentide was 3km thick. Then a big warming occurred, apparently caused by a slight orbital shift which increased radiation that the Earth received from the Sun. Dr Carlson's team calculated that the Laurentide had two bursts of very fast melting before it finally disappeared about 6,500 years ago. The first phase, around 9,000 years ago, drove up sea levels by around 7m, at a rate of 1.3cm each year. The second, around 7,500 years ago, accounted for a rise of 5m at the rate of 1cm annually. The latest discovery has raised worrying questions about the future stability of Greenland's Ice Sheet, since a spurt in warming will be mirrored once more by the end of this century, scientists say. 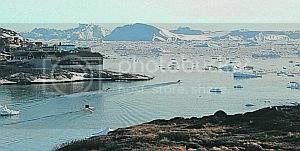 The researchers caution that Greenland is an island bathed in chill water, has a somewhat different geology from that of North America, and so the timetable of the Laurentide's break-up may not exactly apply to it. Even so, the upper range of the Intergovernmental Panel on Climate Change's (IPCC) temperature estimates at century's end are in line with those of the naturally-induced warming that doomed the Laurentide, they said. The IPCC had predicted warming of 1.8 to 4 deg C over the century. Although scientists are confident the mighty store of land ice on the Antarctic has so far escaped major damage, they are far less sure about Greenland, whose ice sheet holds enough water to drive up sea levels by 7m. In addition, the Greenland Ice Sheet is far smaller than the Laurentide was and thus lacks frigid bulk to help shield off warming. 'We have never seen an ice sheet retreat significantly or even disappear before, yet this may happen for the Greenland Ice Sheet in the coming centuries to millennia,' said Dr Carlson. 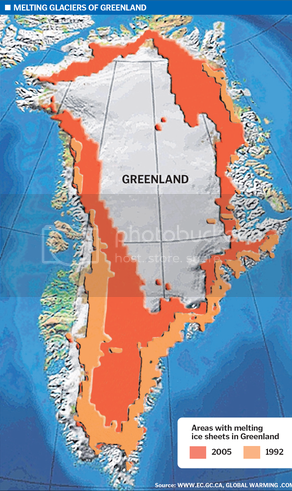 In a commentary, published in Nature Geoscience, scientists Mark Siddall and Michael Kaplan said Greenland's glacial slab was entering into a temperature range at which it was becoming 'particularly vulnerable'. 'The (new) work suggests that future reductions of the Greenland Ice Sheet on the order of 1m per century are not out of the question,' they said. • Rising sea levels would spell catastrophe for 136 port and delta cities around the world. • Up to 150 million people in the big coastal cities are likely to be at risk from flooding by the 2070s - more than three times as many as now. • Of the 10 most exposed cities, nine are in Asia. These are Bangkok, Dhaka, Guangzhou, Haiphong, Ho Chi Minh City, Kolkata, Mumbai, Shanghai and Yangon. • Cities most at risk of catastrophes, in terms of exposed population, are Guangzhou, Ho Chi Minh City, Kolkata, Miami, Mumbai, New Orleans and Shanghai. • Singapore could see coastal erosion and flooding, destruction of mangrove swamps and submerging coral reefs fringing the offshore islands. • Sea water could enter Singapore's coastal reservoirs, such as Kranji, Sarimbun and Seletar, making the water undrinkable. • Commercial areas around the Singapore River, parts of the west coast, parts of Changi Airport and a major part of the recreational land along East Coast Park will also be more vulnerable. • To avoid major catastrophes in Singapore, flood-alleviation projects have been undertaken. Roads have been raised and drains enlarged, a move which will cut down flood- prone areas by more than half in 2011.